Our engineers have designed, built, installed, and supported over one hundred C-Frame Riveters working for Electroimpact or previous employers. The C-Frame Drill Rivet Machine offers a larger part processing capability and can be supplied with various options to meet your manufacturing needs. Ease of set-up and tool-changes with minimum downtime and Automatic Feed System with various tooling makes the Drill Rivet Machine a standard for rivet installation. The C-Frame Drill Rivet Machine with proper upper and lower tooling will handle all standard aircraft-type rivets and all materials capable of being squeezed, while controlled parameters of machine operation contribute to high-order repeatability with a low rivet rejection rate. 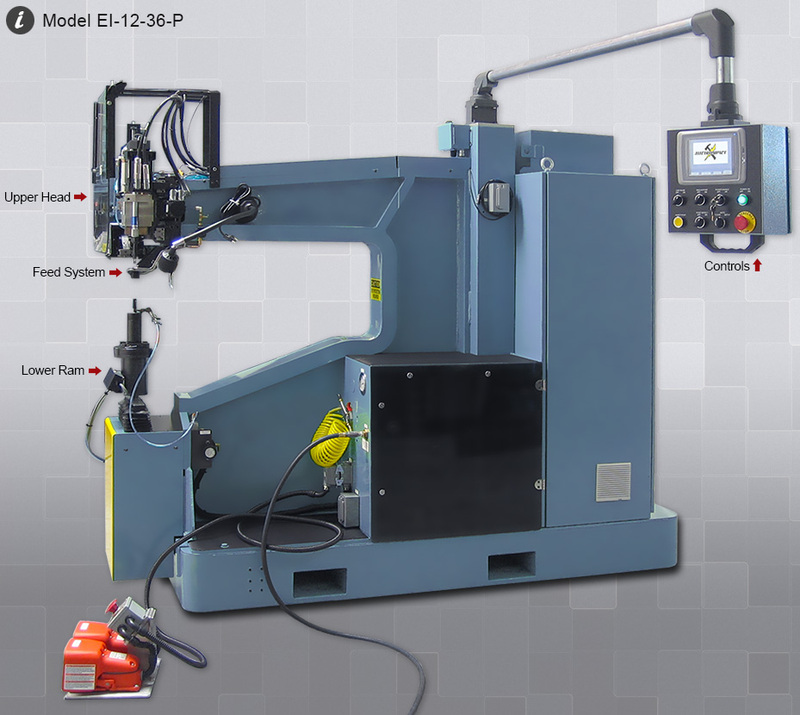 EI C-Frame riveters are available in Portable and Stationary configurations with Nut Plate instillation capability and Leading Edge Dual Ram (Knee) style automatic fastening systems. The EI - Portable Rivet Machine is an automatic drill, seal, rivet machine, utilizing an interchangeable mini-hopper rivet feed system. It is a self-contained system with associated power and control elements all mounted on a roll around cart or C-frame structure. The EI - Portable Riveter is comes standard as a single spindle, but is offered with an optional dual spindle model. The drill spindle has a feed rate capability of 2-96 inches per minute, and is capable of drilling quality holes using various drill bits in different aluminum alloys and maintain hole quality specifications. Models can be purchased with a 30" or 36" (inch) throat depth. 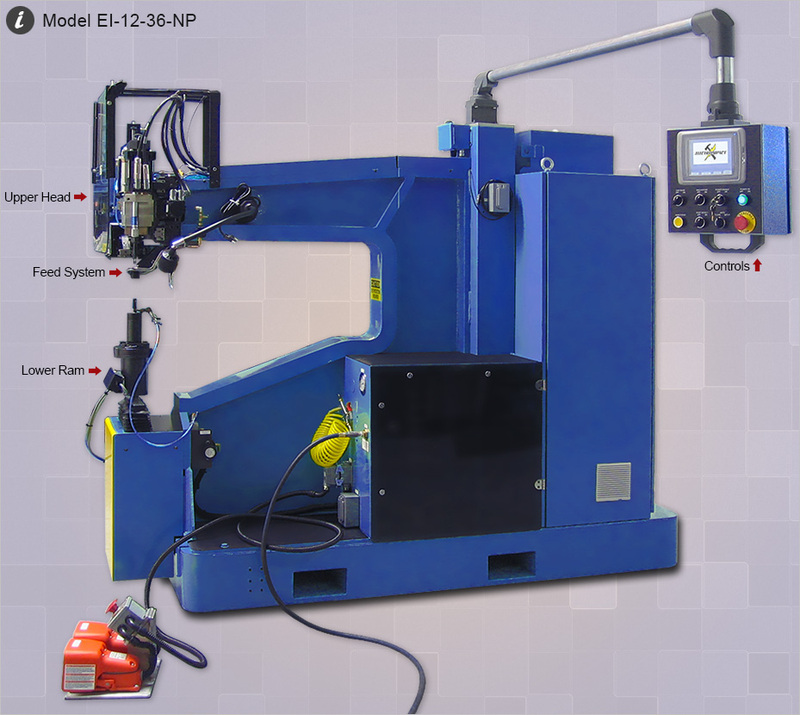 All versions of the EI Portable C-Frame Rivet Machine operate on 110-volt AC power and standard shop air (85 PSI). Units can be purchased with full electrical capabilities. Stationary C-Frame Rivet Machines are available with throat depths up to 60" and 84" inches. Stationary C-Frame Riveters are available as a standard single spindle model or a dual spindle model. Nut Plate Riveters will automatically install nut plates or dome nuts. The machine will drill and countersink the two nut plate mounting holes, install the nut plate and upset the fasteners. The machine can also be supplied with a second drill spindle for drilling the nut plate center hole. Leading Edge Dual Ram (Knee) style automatic fastening machines have a unique ram design, which allows the fastening of leading edges, and close clearance parts. The narrow ram can reach inside of many parts and, therefore allows automatic fastening in areas that cannot be fastened on conventional lower rams. Mouse over the sections below. 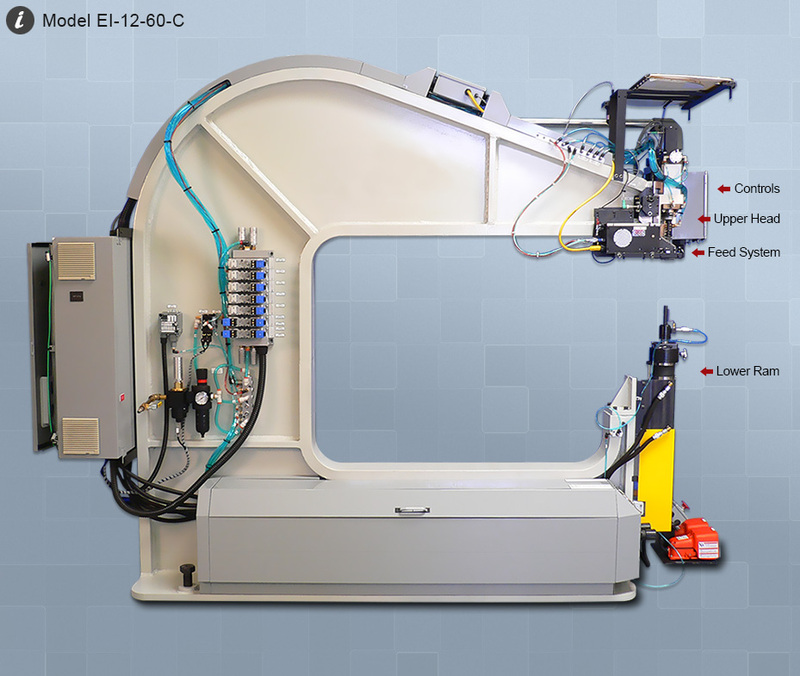 The EI - Portable Rivet machine can be used to process various parts from small sub-assemblies to medium size assemblies. The EI - Portable Riveter is comes standard as a single spindle, but is offered with a dual spindle model. The drill spindle has a feed rate capability of 2-96 inches per minute, and is capable of drilling quality holes using various drill bits in different aluminum alloys and maintain hole quality specifications. The EI - Portable Riveter is also offered in a floor-mounted C-frame version. The many, various components required for drilling the rivet hole and transfer mechanisms to inserting a rivet in the drilled hole and bucking the rivet head while the shank is upset by the lower anvil. Pneumatic Control Sealant Dispenser "Semco"
Quick Change Sealant Tips "Semco"
The Lower Ram Assembly consists primarily of an air-pressurized turntable arrangement, a lower anvil configuration, and an upset cylinder. Limit switches for clamp and safety, and lower ram clamp turntable for installation and use of various lower anvil tools. Electrical power is required to run the computer logic controller as well as valves, lights and other machine accessories. Pneumatic power is used for the chip blowers, fastener feed systems and the clamping action of the machine. Pneumatic and electrical power is supplied by the user's facility. The function of the rivet feed system is to provide storage space for the required rivets (type, diameter, and length) and to provide the required rivets to the drilled and/or countersunk holes when needed. The Nut Plate Drill Rivet Machine has the capability of installing nut plates or dome nuts. The machine is capable of drilling various Nut Plate fastener holes, countersinking the holes, while the lower ram holds the Nut Plate in position for the installation of the fasteners. The machine can be purchased with various options to included dual drill spindles for installation of the bolt hole requirements. 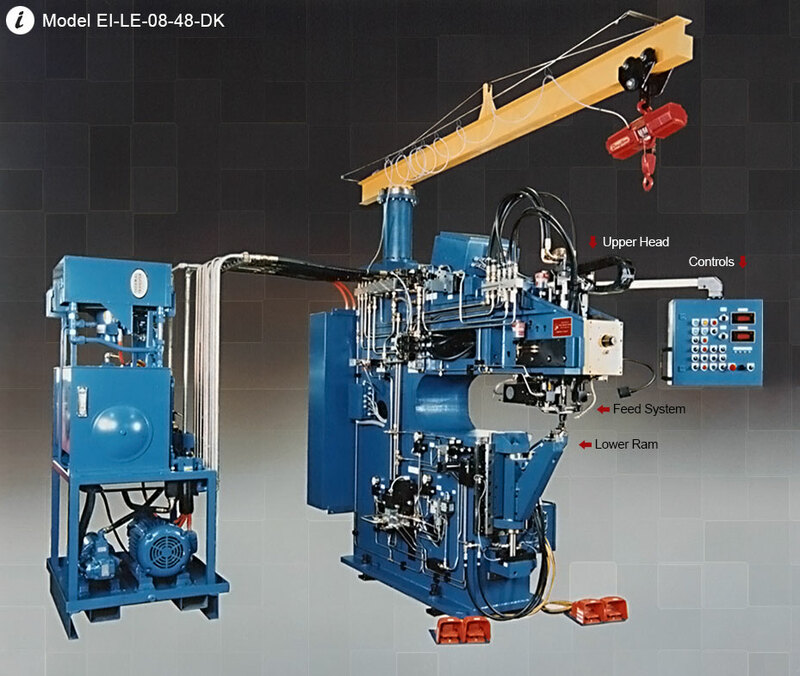 The Model EI-8-36-NP Nut Plate Drill and Rivet Machine is compact, and operator friendly with control systems that allows for fast set-up and tooling changes to increase production and decrease machine down-time. The EI-8-36-NP has the ability to process a wide range of production parts and can be tooled to meet your production requirements. The machine can be purchased with the ability to function as a single rivet installation machine with a simple tool change when not required as a Nut Plate Drill Riveter. Throat depths up to 60 inches are available. Upset Force of 8,000 lbs. Electroimpact, Inc. is pleased to offer the Stationary C-Frame Riveter Series. Using the same technology associated with Portable Series Riveter, which allows for production of larger part assemblies. C-Frame sizes are available in ranges up to 96" and upset forces up to 14000 lbs. Feed Systems can be supplied with Mini-Hoppers, Hoppers or Vibratory Feeder Bowls. Electroimpact, Inc. is pleased to offer an 84" Stationary C-Frame Drill Rivet Machine. The Drill Rivet Machine offers a larger part processing capability and can be supplied with various options to meet your manufacturing needs. Ease of set-up and tool-changes with minimum downtime and Automatic Feed System with various tooling makes the Drill Rivet Machine a standard for rivet installation. 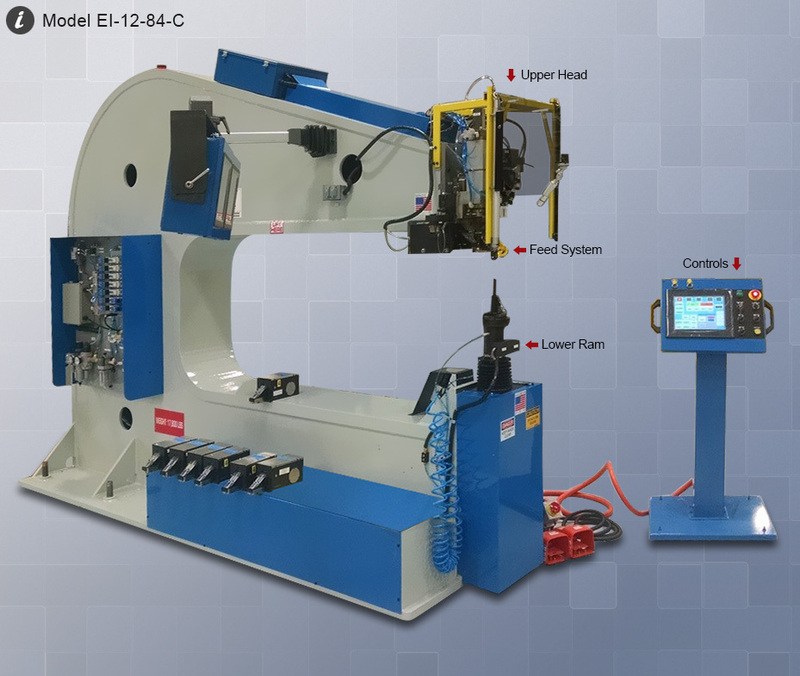 The Leading Edge Dual Ram (Knee) style automatic fastening machine, is supplied with two lower rams, each sized, and configured to allow for primary fastening of flanges inside the leading edge of the wing section. This allows for processing of close clearance parts, ducts and can be used on standard flat assemblies for rivet installation. The lower ram allows for access for various parts that a standard lower ram may not be able to reach. This is the advantage over conventional lower ram configurations. The lower ram consists of rotational tools that can be rotated 90 degrees to allow for access on each side of the stringer in most aircraft parts. The ram provides 4 (four) working positions and easy access to fasteners located in corners of the production parts. The machine can be supplied with either a Mini-Hopper Feed System or a Vibratory / Hopper Automatic Feed System. Machine upset is hydraulically actuated and applies upset forces up to 8,000 pounds for installation of fasteners up to 3/16 inch. The upper head consists of a highly reliable toggle link transfer with the capability of supplying all your fastening needs. A hydraulic cylinder is the heart of the lower ram assembly. It positions the lower ram horn as required by the machine sequence. This cylinder applies the force to the rivet to complete the upset process. The upset cylinder has a maximum of 8,400 pounds of force for horn #1 and 5,600 pounds of force for horn #2. The machine requires electrical, hydraulic, and pneumatic power sources for operation. Electrical power is used to control the computer (Programmable Logic Controller) as well as valves, lights and other machine accessories. Pneumatic power is used for the chip blowers, fastener feed systems and the clamping action of the machine. Hydraulic power provides control head movement, resilient pressure foot bushing and drill feed. The operating pressure for the hydraulic power unit is 1000 PSI Pneumatic hydraulic and electrical power is supplied by the user's facility.